Back in May of this year, I did a few posts on the benefits of using natural lighting for your photo shoots (check the archives if you haven’t seen these yet). But what about shooting with artificial lighting, say in a light tent or a light box? Or how about just adding some supplemental lighting to your tabletop or floor setup? Choosing the right lights can make all the difference in any of these situations. So today I’m going to give you some lighting basics, help you to be a smarter shopper and even give you my recommendation. To keep things as simple (and as brief) as possible, I’m only going to be covering “Compact Fluorescent Lamps” (CFLs) today. These bulbs have become pretty popular, and they’re nice for photography because they’re cool enough that they won’t set fire to your light box like a halogen or incandescent bulb can! Want to compare different lights? The first step is finding the “lumens” rating on the packaging. You don’t need to know this, but a lumen is a measure of “luminous flux.” That’s a measure not of how much light is emitted by a bulb, but rather how much of that light makes it to a specific target. Need more details? Just ask – I’ll be happy to oblige. What Does “Color Temperature” Mean? So what’s a “Daylight Bulb”? There’s really no such thing! Think about it. Look at the color temperature graph above. Look at the difference in color temperatures at different times of day. Now confound things even more with different times of year and different weather conditions. Think about it some more. Picture yourself outside at the beach at sunrise or sunset versus mid-day. Or just go outside right now (if it’s during the day) and look at the sky in several different directions. Does it look the same? No way! The best a bulb can do is to provide light at a specific “correlated color temperature” (CCT, for short). 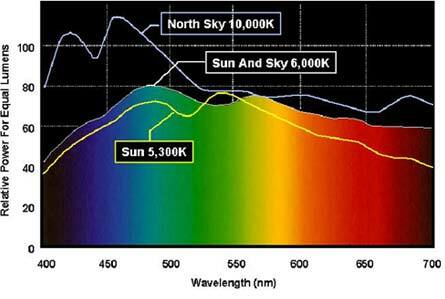 The CCT is simply an approximation of the color temperature as our eyes perceive it. So a 5500K bulb can only be a “daylight bulb” at a particular time of day, during a particular time of year, under a particular set of weather conditions. Full Spectrum Bulbs Are Good, Right? Are there any lights that actually match this spectrum? NO! That’s a pretty straight-forward answer, right? Okay, let me expound on that a little bit. Umm … NO! Sorry, that’s all I got. Some lights do cover a wide range of wavelengths (colors), but unless you can find a spectragraph for those lights, you really have no idea what you’re getting. Seeing “Full Spectrum” written on the label is not enough! What the Heck does “CRI” Stand For? CRI is short for “Color Rendering Index.” It can be important when you’re shopping for light bulbs for your photography. It’s an old and somewhat obsolete standard, geared more toward video production, but it’s the best information we have available right now that represents how closely a light can reproduce colors in comparison to an “ideal” (whatever that means) light source. All else being equal, a higher CRI is better than a lower one, and anything above 90 is good for our purposes. The difference between a few CRI points is meaningless, so don’t get hung up on comparing between values like 89 and 91. Are “OttLite” Bulbs Any Good? Well, yes and no. There’s really nothing wrong with them; it’s just that they’re not the brightest bulbs in the chandelier. Literally, they’re not. Nor do they claim to be. By the company’s own admission, “brighter isn’t always better.” You see, they’re talking about reading and task lighting, not photography! Yep, OttLites are designed for “reduced glare, less eyestrain, and low heat.” Sounds to me that they would be more useful in creating your craft rather than photographing it. Who started this whole thing about OttLites being great for photography, anyway? Look at the “Shop by Lifestyle” section of their website. See anything about “Photography?” Me neither. Although the OttLite website isn’t very informative, and their packaging and labels are pretty useless, I did manage to get my hands on some data for the three CFLs that they offer. To save you all the trouble of searching for the information, here are the specs for their “brightest” bulb, the 25EDP2R. I see two issues with the above. Firstly, 1300 lumens is not a lot (not very bright). And this is their brightest bulb! When you listen to someone telling you to go out and “buy an OttLite,” without providing any specifics, you may very well end up with the 750 lumen model. Not good! Secondly, the specs for CRI and CCT are a bit vague. Now that you know what these numbers mean, wouldn’t you like to know their specific values? I sure would! I also asked the OttLite folks for a spectragraph on these bulbs (to see how they compare to natural light), but they told me that the information was proprietary. Oh well. Okay, So What Do You Recommend? Get unstuck from the “brand name” mentality. Buy based on what the product does, not what it’s called. Generic acetylsalicylic acid is a better bargain than Bayer aspirin, right? Learn what’s important about what you’re buying (luminous flux, CRI and CCT) and compare that information between bulbs. If you can’t find this information on the packaging or the website, don’t buy the light. Period. Make your own decisions based on what you learn – don’t blindly take someone’s word (not even mine) on this, or any, subject! Here’s a 45 watt bulb that I like, made by Alzo digital. It’s rated at 2800 lumens, and has a CRI of 91 and a CCT of 5500K (I even have the spectragraph if anyone is interested). Put a couple of these bulbs in 10-1/2″ aluminum reflector clamp lights like these (available at just about any hardware store) and see what they do for your photos! You can get these bulbs directly from the manufacturer, from Amazon.com, or from any number of other retailers. Or, if you decide against Alzo, there are plenty of other options. You just need to do a little research, compare some specs, and make sure you’re getting the most for your money. I know this post may be a little confusing to some of you, not because of your intellect but because of my attempt to jam so much information in a relatively small article. So if you have any questions of any kind, please feel free to ask. After all, I’d like you to be both a better photographer and a smarter shopper! Until next time … Happy Shooting (and Shopping)! I know someone who uses full-spectrum lights from the pet store, the ones sold to replace natural light for reptiles. I don’t think the ones we had for our day gecko are bright enough for most light boxes, however. But they are another option! That’s a great idea. It’s nice to have more options, and as long as we stay well-informed, we can choose what’s best for each of our particular applications. Thank you for the link to your blog, I found it very informative. I will give up looking for Ott! Getting good product photographs is so hard! Thanks for your input. Well, no wonder I haven’t been happy with the results from my Ott lights! Thanks for the heads-up. I’ll be reading soon enough! You won’t need the extender for the 10-1/2″ clamp light that I show, but you might need it for the 8-1/2″ ones commonly sold at Home Depot or Wal-Mart. Best bet, if you don’t already have the clamp light, is to take the bulb with you when you go shopping to be sure it fits. Or, you can just buy the extender, but that could possibly be a waste of money.